It’s been awhile since we’ve featured any home renovation / decorating, and quite frankly I miss it. Thankfully we have a number of areas in our home that we’ve been living with for the last five years, that were left open to new interpretations. 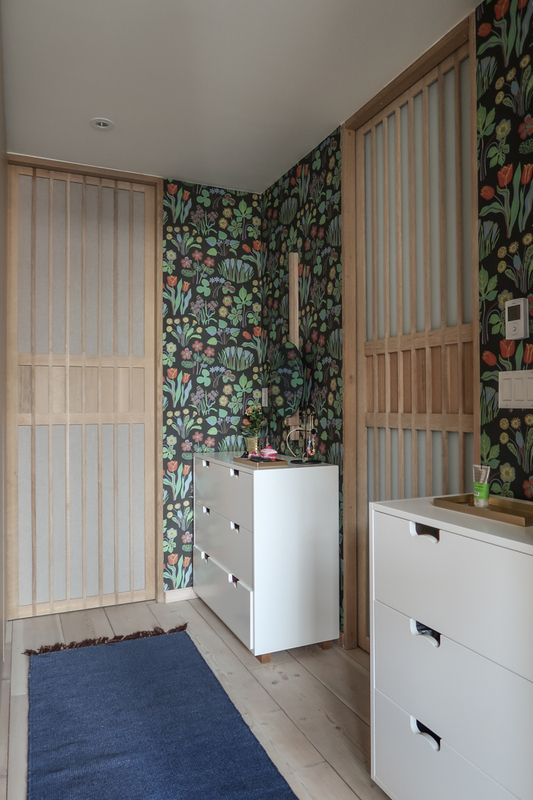 Our sleeping quarters are uniquely constructed in that they are all connected via gorgeously crafted shoji style sliding doors. We did things this way because our bedrooms are on the second floor and run alongside two entry points. This internal corridor of sorts provides for more privacy and a sense of containment and intimacy that the more open entry corridor lacks. Although it felt frivolous to have two full bathrooms, we knew we were having two children and that one day they would become teenagers. 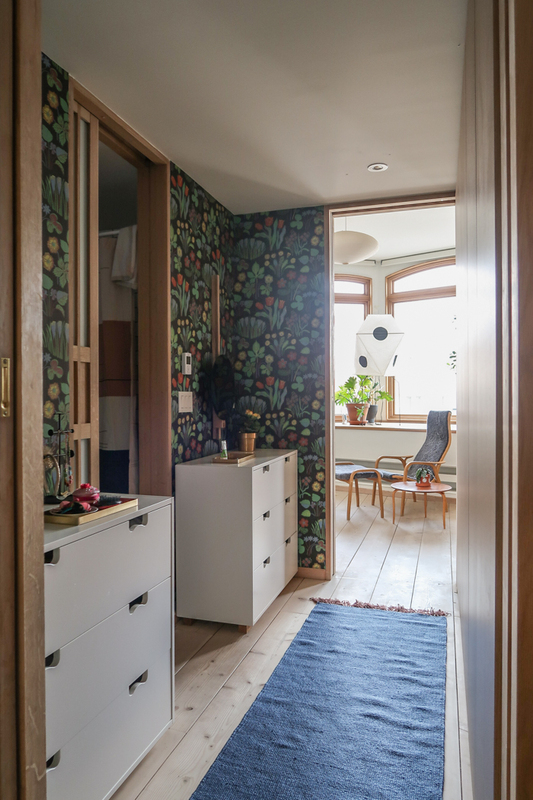 A space was created between their bedrooms that contains a bathroom and shared closet area, only accessible via their bedrooms. I really wish that I had taken a before photo of the space but I’ll describe it for you. On one side there is a wall to wall oak closet unit from Ikea, and on the other are two Snow cabinets which flank the bathroom door. The walls were white (barely, I think the painters only did one coat of paint!) and there were two random and mismatched small carpets on the floor. On top of the dressers was a mess of boxes containing diapers and other random things, tons of jewellery, hair accessories and nik naks. The space felt unfinished, and we treated it as such, an inevitable dumping ground. 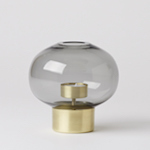 We are huge fans of the classic Swedish shop and design institution Svenskt Tenn. 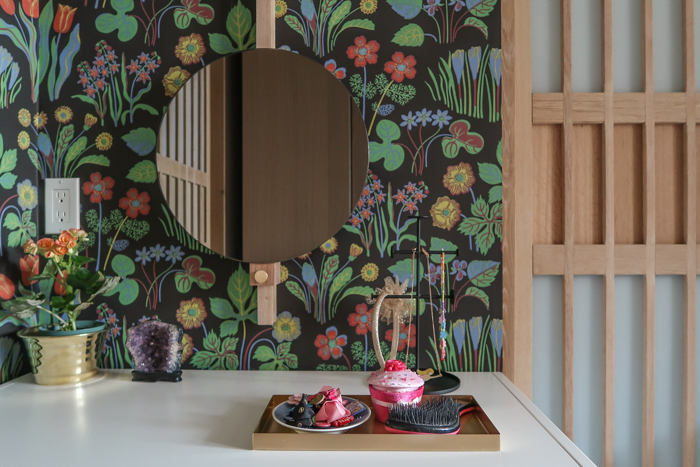 In particular, we have been trying to incorporate the patterns of Josef Frank into our life, with little success (at one point we had some curtains made for our daughter’s room, but a mistake was made with sizing, and our daughter was scared of the more mature print that was chosen). We finally took the plunge and bought a couple of rolls of Josef Frank’s Vårklockor print. I looked on HomeStars for someone who would be willing to do this small job and found Vlad, who was great! He communicated well, was tidy and did a perfect job, considering this type of wallpaper is not the current convention and more tricky to work with. WOW! It has totally transformed the space–and possibly our bedtime routine. Not only is it a joy to behold, but it’s also keeping us in line with regards to maintaining the space. After the wallpaper was installed, we did a little shopping for accessories. The reversible blue/grey Nomad runner rug is from Ferm Living. 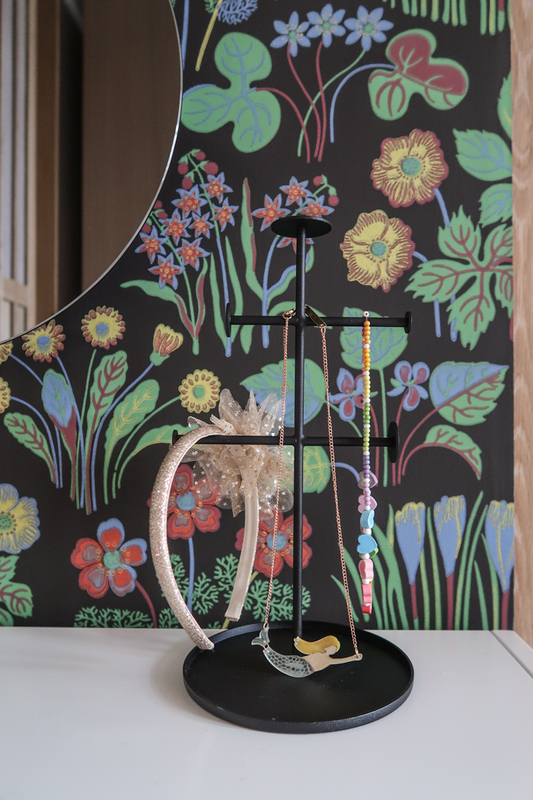 Finally, we were able to use our very own Doverail Mirror by Hallgeir Homstvedt, which is adjustable while the kids grow. Funny enough, the kids are still a smidge too short at this lowest setting, thanks to the taller dressers, but soon enough they will be able to start using them! We were at the ROM on Saturday and the kids FINALLY enjoy going into the rocks and minerals room. I almost had a problem on my hands when Elodie fixated on acquiring a gemstone for herself (she cleverly mentioned that the ROM shop would have them…I managed to keep her moving along, crisis averted). 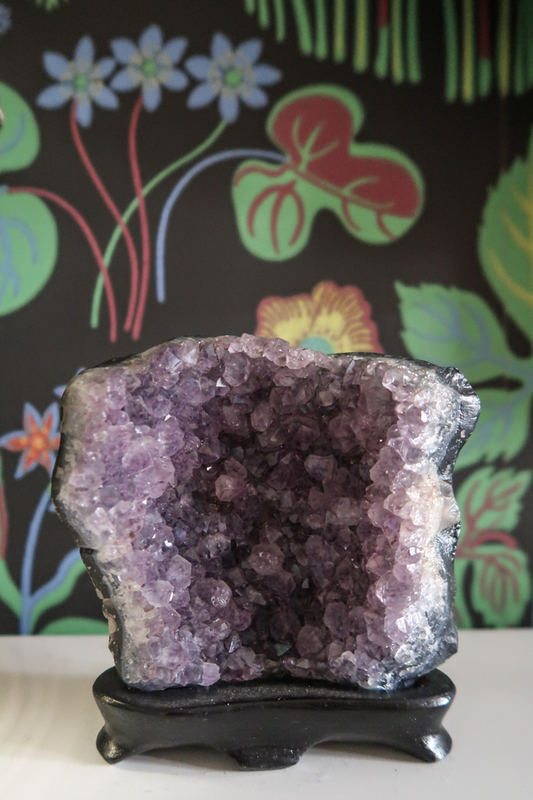 As luck would have it, this amethyst piece showed up in the shop on Monday, from one of John’s antiques orders. Wavy Planter from Svenskt Tenn.
Plant from new local flower shop Wildhood. Elodie picked orange, Howell picked yellow. Brass trays from Ferm Living. 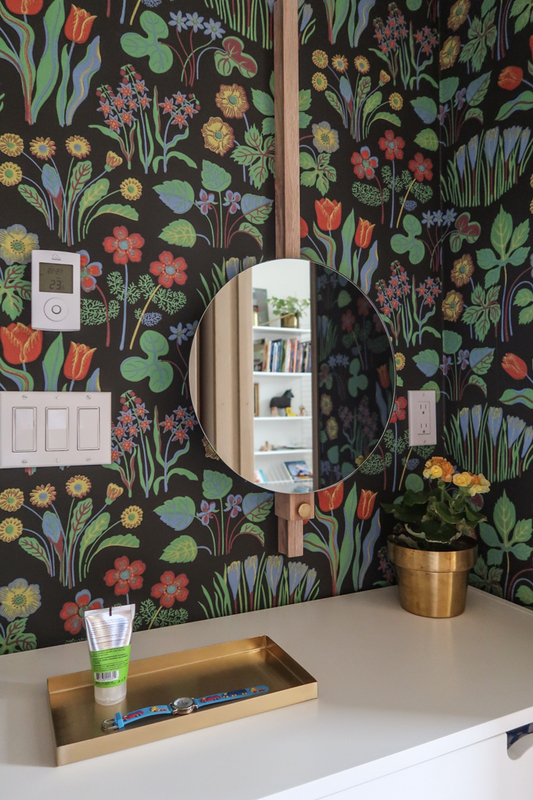 We are super happy with the results, and will be updating two more small spaces with a splash of Josef Frank colour in the coming month.